I think just about everyone (including me) was surprised by yesterday’s announcement from Hardkernel—better known for boards powered by the Samsung Exynos SoC—of a Raspberry Pi compatible board called the ODROID-W. Tested against the latest NOOBS and Raspbian images the board is software compatible with the Raspberry Pi. While there have been form-factor compatible board available—like the Hummingboard—none of them have made use of the same Broadcom BCM2835 SoC as the Pi, so none of them (until now) have been software compatible. Surprised because, while the Broadcom SoC is a commercial product—for instance some Roku models make use of it—there seems to have been no knowledge, at least according to forum postings, of this Raspberry Pi competitor even amongst Broadcom insiders such as James Hughes and Eben Upton. The only Raspberry Pi specific software that isn’t open source right now is the bootloader which contains the GPU “binary blobs” needed to talk to the 2835’s multimedia hardware. Although the VideoCore IV graphics core driver source has been released, there are still significant parts of the hardware that require use of an open-source shim running on the ARM11 talking to a proprietary binary blob via a communication driver in the Linux kernel. However as the binary blob was developed by Broadcom, it’s possible that along with buying the chip Hardkernel also bought rights to use the bootloaders. So while the Raspberry Pi itself is (mostly) closed source, mainly due to the use of the Broadcom chip—and despite complaints from the Raspberry Pi community—there doesn’t seem to be any legal issue surrounding the ODROID-W.
At least at the moment, because I do wonder whether the Foundation will have anything to say about the use of the Raspberry Pi name to advertise the board. It looks like the Pi Foundation are now finally facing the same issues here that’s plagued the Arduino for so long. 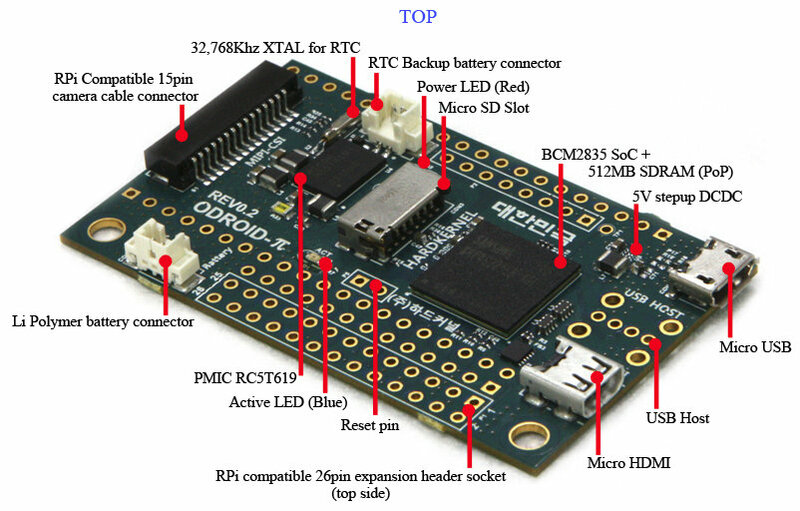 The board itself has a smaller form factor than the Raspberry Pi, while keeping the HDMI, USB and CSI interfaces. It also comes with a Raspberry Pi compatible 26-pin expansion header along with extra headers for more GPIO and—interestingly—an ADC. The board also has an battery backed-up Real Time Clock (RTC) and an additional Li-Po battery connector. What the board doesn’t have is on-board Ethernet, although that can be fixed with the addition of a Docking Board—which as well as an Ethernet jack has four full sized USB hosts ports, an audio jack and a UART port for a serial console. The ODROID-W will cost $30 and will be shipping towards the end of next month.